President Trump escalated pressure on North Korea as part of his ongoing economic warfare against Pyongyang. On Thursday, he issued an executive order that would penalize any company or person doing business with North Korea by either cutting off their access to the U.S. financial system or freezing their assets — or potentially both. Trump also said that China’s central bank had asked its own banks to cut ties with North Korea’s leader Kim Jong Un. “I’m very proud to tell you that, as you may have just heard moments ago, China, their central bank has told their other banks — that’s a massive banking system — to immediately stop doing business with North Korea,” he said alongside South Korean President Moon Jae-in and Japanese Prime Minister Shinzo Abe in New York. The Chinese government has yet to publicly announce any action. What do the new sanctions allow U.S. officials to do? Treasury Secretary Steven Mnuchin and Secretary of State Rex Tillerson now have more power than ever to slap a range of sanctions aimed at curbing North Korea’s nuclear efforts. Mnuchin will be able to freeze assets of any individual or business that trades in goods, services or technology with Pyongyang. “Foreign financial institutions are now on notice that going forward they can choose to do business with the United States or North Korea, but not both,” Mnuchin said. The U.S. government can now also target companies in a range of industries: banks, energy, manufacturing, textiles and fishing. Even shipsand aircraft that go to North Korea would be banned from the United States for 180 days. Mnuchin said the new executive order — effective Sept. 21 — will be “forward looking” and not target past financial transactions. He declined to comment on any plans to impose further sanctions. Will the order target U.S. banks, too? No, not exactly. U.S. financial institutions — like JPMorgan Chase, Wells Fargo, Bank of America — are already barred by law from pursuing any financial transactions directly or indirectly with North Korea. But those banks will now risk having their own assets frozen or being shut out of the U.S. financial system.They’ll have to be even better at keeping a close eye on who they are doing business with and whether those companies have ties to North Korea. 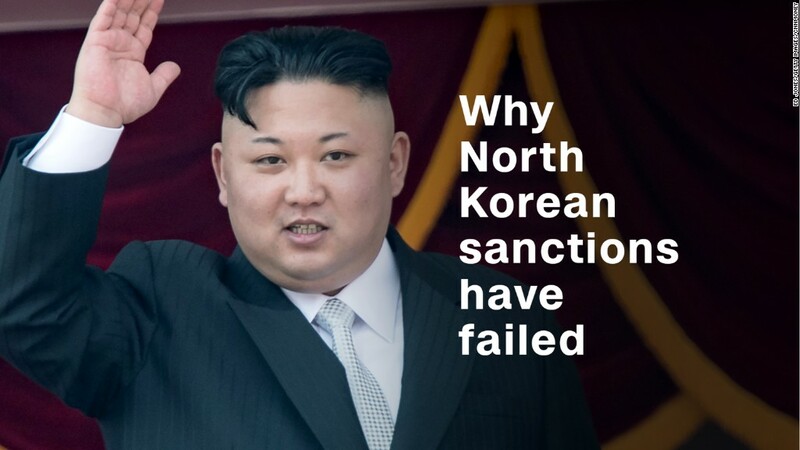 “If banks really want to investigate their own North Korean transactions, they’re going to need to investigate the companies, and the companies that do business with those companies,” said Anthony Ruggiero, a senior fellow at the Foundation for the Defense of Democracies. What countries will Trump’s order target most? This one is harder to square. The administration says, “Everyone.” But not everyone does business with North Korea. The isolated country typically does business with a limited number of countries — China, Russia and South Korea, among them. China is by far North Korea’s largest trading partner. But Mnuchin repeatedly said that Thursday’s step was not targeted at China alone. “This action is directed at everyone. It is in no way directed specifically at China. We look forward to working very closely with them,” Mnuchin said. Recent disclosures show North Korea used Chinese banks to process at least $ 2.2 billion in transactions through the U.S. financial system between 2009 to 2017, according to Ruggiero. Did China’s central bank take action against North Korea? That’s not really clear. Reuters,citing unnamed sources, reported that the People’s Bank of China had told its own financial institutions to stop dealing with North Korea’s regime. But Mnuchin was later asked multiple times by reporters to confirm that, but he demurred. Do you have too much money in cash?